The Store-It! 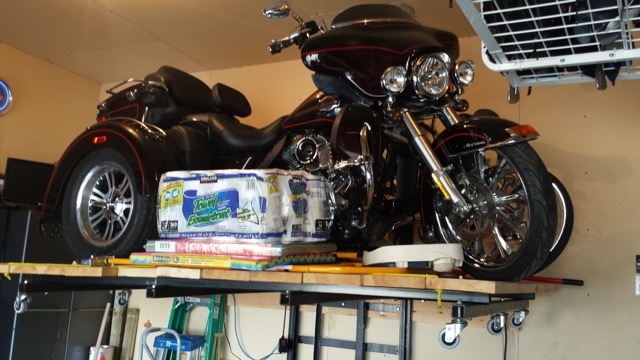 lift can be used for different uses. 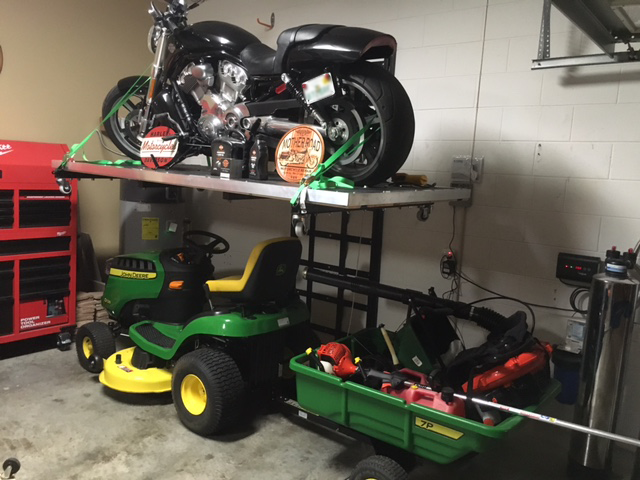 Its large platform offers the space needed for safely lifting and storing motorcycles, trikes, riding lawnmowers, personal watercraft, snowmobiles, golf carts, ATV’s, side x sides, kid’s toys, firewood, snowblowers and other in the way shop equipment. 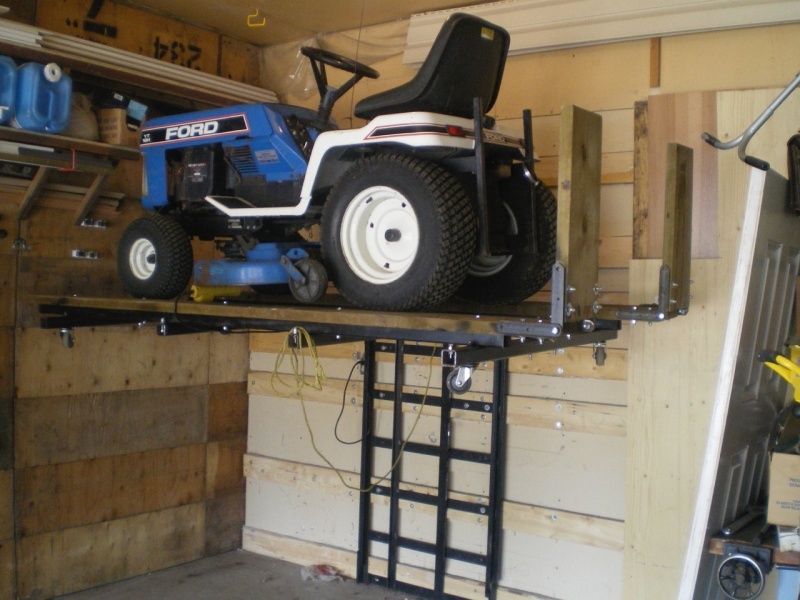 Uses also include using as an adjustable work bench that can double as a place to store your larger shop saws on and also as an Equipment Elevator Lift for moving items up to a second floor. The Store-It! 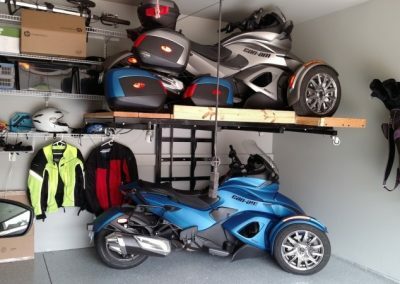 lift consumes zero floor space which allows you to create the one thing your short on which is “floor space” to allow you keep both bike and vehicle safely in the garage and is a fraction of the cost to building out more garage space. Constructed of industrial grade steel. Lifting capacity of 1500 lbs. 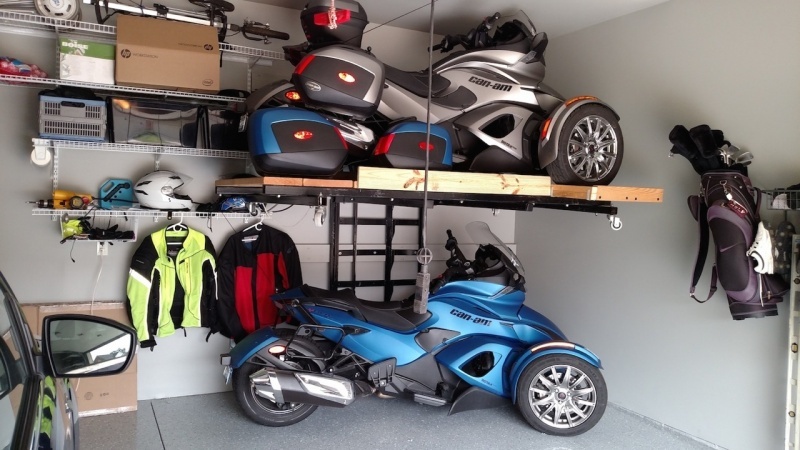 The loaded weight is distributed 80 percent to the floor and 20 percent outward from the wall. Can be stopped at any height and has a positive lock engagement every six inches starting above the first 24″ of travel. 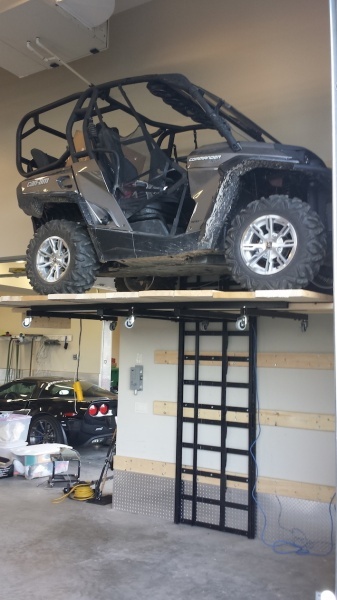 Operation is extremely safe and secure with TWO safety stop systems backing each other up. Industrial 110v cable hoist with integrated safety brake system will prevent the platform from dropping or sinking. Automatically engaging dual ratcheting safety lock system. 4200lb. Industrial grade lifting cable. 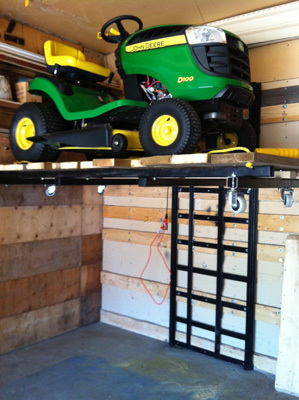 The electric hoist is mounted at the top of the frame which reduces accessible pinch points. Absolute secure parking underneath for your vehicle or another recreational power-sport. Mainframe Superstructure standard height is 10′. 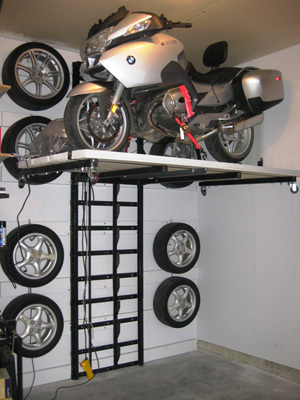 If you require more lifting height, extended height frames can be “Specially Ordered”. 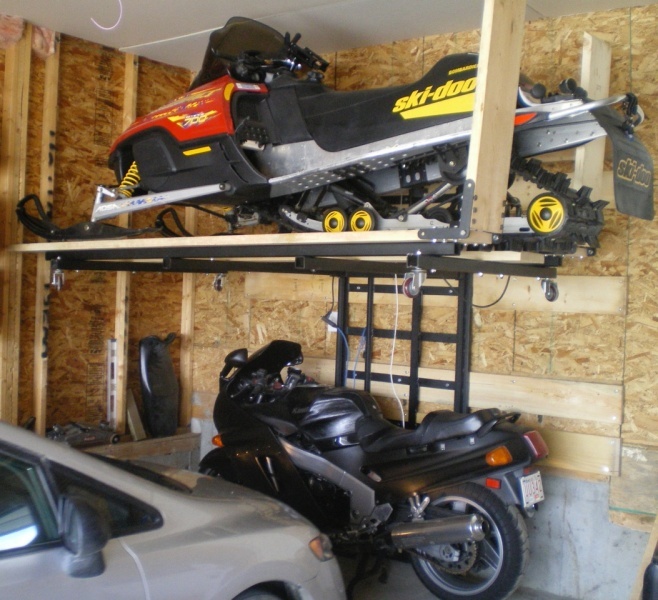 The 10′ frame will provide 7′ max clearance when in the fully raised position. Mainframe can be sized down for ceiling heights less than 10′. Note: This does reduce the overall platform clearance. e.g. 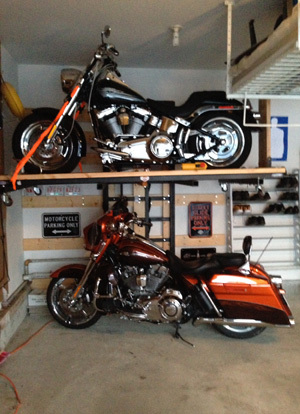 An 8′ high frame will have 5′ of max clearance and a 9′ frame will have 6′ of max clearance when fully raised. 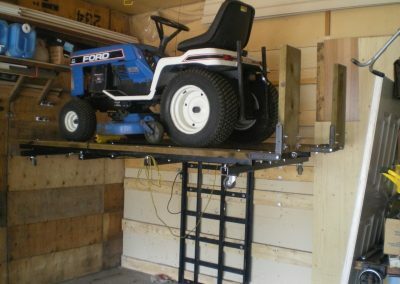 The removable platform design will allow for the platform to be loaded elsewhere rolling on industrial heavy duty casters. 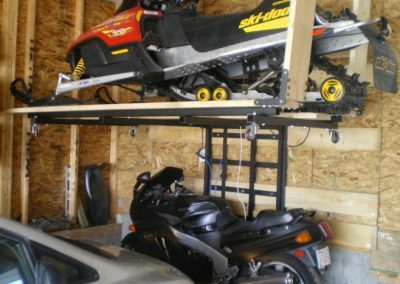 An excellent option for those who are tight on space to load and off-load the platform. Casters sold separately. The standard platform framework size is 4′ x 8′. Two sheets of 3/4″ plywood required for platform “not included”. Additional platform framework sizes can be “Specially Ordered”. Approximate 9 inch platform loading height. Multiple D-ring tie down attachment points. 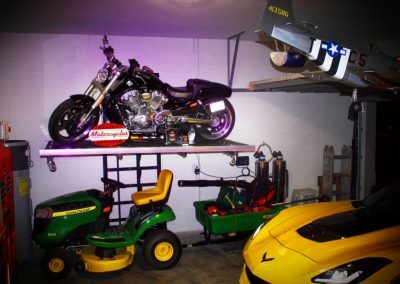 Securely store your prized possessions up and out of reach. Industrial quality is designed to last. 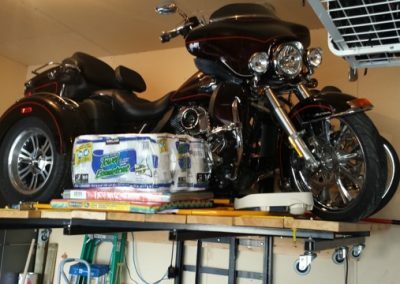 The best cost effective storage option. Industrial heavy duty total lock casters. Motorcycle platform mounted wheel chock. Wireless remote control, a must have for the custom extended height mainframes. Diamond plate black rubber platform mat. Provides an attractive non-skid platform sub-floor covering. Diamond plate aluminum angle available in chrome mirror or black matte finish. 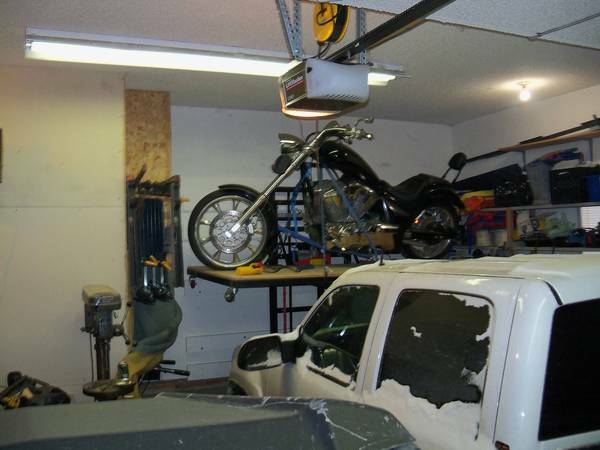 Provides that polished custom look by wrapping down and covering the visible edge of the plywood. Brushed aluminum angle available in 17 different colors when black or chrome just won’t do. Special order extended Mainframe Superstructure heights. Built to custom specs for specialized use applications, e.g. equipment elevator lifts. 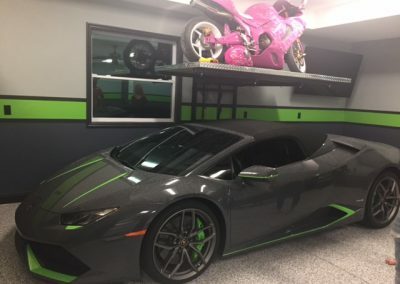 How do I get one of these in my garage? 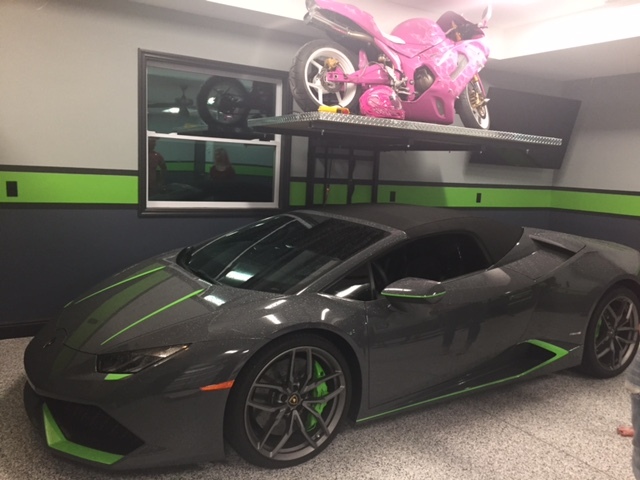 You may receive future messages from Garage Evolution after submitting this form.